Next post: Should you tip your flight attendant? My first Op-Ed. Los Angeles Times, A25. 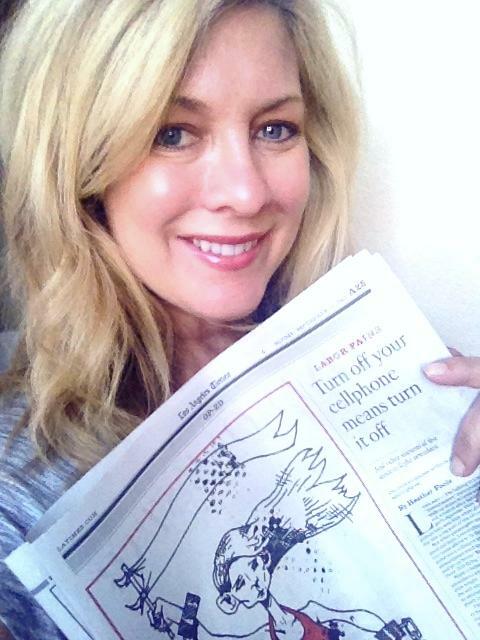 They changed the title from “flying the less-friendly skies” to “Turn off your cell phone means turn it off” in the paper. I liked the original one better. It’s more in the spirit of the piece. And yeah, the handcuffs got cut out. Long ago — I’m talking in the 1960s — “stewardesses” were taught how to walk up stairs in heels and how to blow out a match after lighting a passenger’s cigarette. They were issued pillbox hats and little white gloves. Their glamour was a big part of the allure of airline travel. Hard to believe, I know, but these days flight attendants are allowed to grow old and gain a little weight. As long as we can still fit through the exit window, buckle our seat belts without an extension and, most important, pass the yearly training, we can fly as long as we want. I’ve been a flight attendant for a major carrier for 18 years, and I’ve seen a lot of changes in that time. But nothing changed my job more than 9/11. Since then, at yearly training we focus more on safety and security than service. We’re taught karate. We talk about throwing hot coffee at lunging terrorists and other things I’m not at liberty to discuss. “This is not what I signed up for,” I’ve often heard veteran flight attendants mumble during class. At the same time, with turmoil in the industry and rising fuel costs — and, more recently, with the recession — airlines are more focused than ever on the bottom line. Flight attendants have taken multiple pay cuts. We’ve watched days grow longer and layovers grow shorter. Sometimes, with only the minimum required eight hours behind a hotel room door, it feels like there’s not enough time to eat, sleep and shower. Great post, and not patrolling the use of electronics would make boarding so much easier. I can only imagine if they allowed cell phone use in flight. I can hear the call buttons now, ringing the call button to ask us to tell a passenger to not talk as loud….I hope cell phone use is never allowed in the air…for everyones sake.